The reason for making this project is that I was always fascinated by Conways Game of Life. It’s a great demonstration of the fact that simple things with a very simple set of rules can do wonderful things: spawn more of them, modify themselves, do logical operations, even create Turing machines. I suspect much more can be done using them, but there are even more interesting methods of doing so. I made a simple implementation of Life on a PC, but so have a bazilion other people before me, of which I found very useful this one. My implementation is on a simpler device: An AVR with a 4×20 character display. The outcome of these rules is somewhat complex – a simple patern may create real marvels. Try loading some examples from the link above. I play with AVRs alot – therefore I have chosen to use an AVR to control the process. 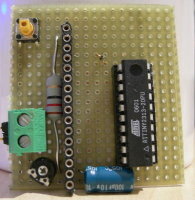 The circuit is extremely simple – one AVR – the ATTiny2313, two resistors, a button, an LCD, two caps and that’s it! 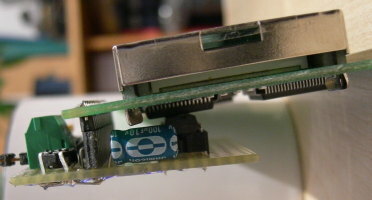 The resistor is there to limit the current flowing into the backlight of the LCD. The button adds a few random cells into the space. The whole device runs of 5V. Power consumption is quite low – when you have no backlight on the LCD. 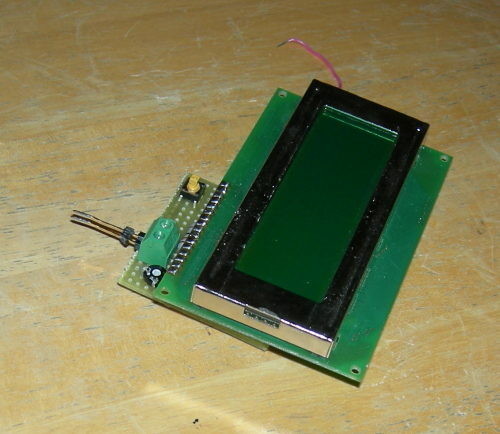 If you have, than it can be anything from 100mA to 0.5A, depending on the type of the LCD used. The Game of Life requires quite a lot of space – not program, but it requires a lot of cells to grow in. The disadvantage of any character LCD is its size – the biggest have 4 lines and 40 columns, which totals up to 160 characters. 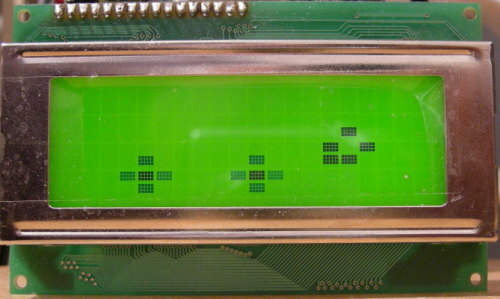 The software for this piece is very simple: it only uses two global arrays (makes the program smaller (in output size) than playing with pointers most of the time), a simple set of functions to determine whether a cell at x,y is alive, how many neighbours does it have, to liven it up or kill it, or display the output onto the display. At first I used my own custom library to do the communication with the LCD. It worked, but then I tried using Peter Fleurys LCD library, which is very cool, is tested and worked like a charm. I’m not lazy to build one my self, but why not use a great one that’s prebuilt and well documented? The code flow is very simple: First, the HW is initialized, than the space is filled with a random patern (the random paterns are different each time – the device stores the previous settings in it’s EEPROM), then goes into a loop where it displays the old generation, then recalculates the next generation of cells, storest it into the old generation, and detects whether the patern displayed is boring. Then it loops. -If the frame is static (the old generation is equal to the new generation) or there have been less than 2 changes, than it is boring. -If there’s less than 6 live cells on the whole space, than it is boring. -If 200 generations have passed since the last boredom event occured, than it is boring. -If the user pressed the boring button it is boring. The software was written in C and compiled using the WinAVR avrgcc distribution, and using AVRStudio as the main IDE. The sourcecode is also included in the zip file. contains the .hex file (main.hex) which needs to be programmed into the processor, the source codes, and the schematic, both in png and in eagle. I have created this device for fun and to help me understand the Universe a little better. If you decide to build one – feel free to do so, but send me a photo – I will post it here and link it to your page. The source and everything is distributed under the GPL licence, with the exception of the library of Mr. Fluery, which is his own creation and a different licence may apply to it. your design has an error! and the 16th pin must connect to gnd. please correct your schematic. thanks.